The year 2014 will be remembered for the war against the Islamic State, the interim nuclear deal with Iran, Hamas’ brutal kidnapping and murder of Israeli teens and other harrowing developments. CAIR or the Council on American-Islamic Relations has been in existence for 20 years — since June 1994 — when it opened up its national headquarters in Washington, D.C. The group was established as being a part of the American Palestine Committee, an umbrella organization run by then-global Hamas leader Mousa Abu Marzook, who was based in the U.S. at the time and who now operates out of Egypt as a spokesman for Hamas. Only months before the creation of CAIR, Awad announced his support for Hamas…. Billoo proudly announced on her blog that her younger brother, Ahmed, was quoted in an article in the Los Angeles Jewish Journal — an article that discusses in length about how her brother supports suicide bombings. Billoo wrote that she, herself, had thoughts of committing suicide, after she viewed a pro-Israel advertisement on a San Francisco train. 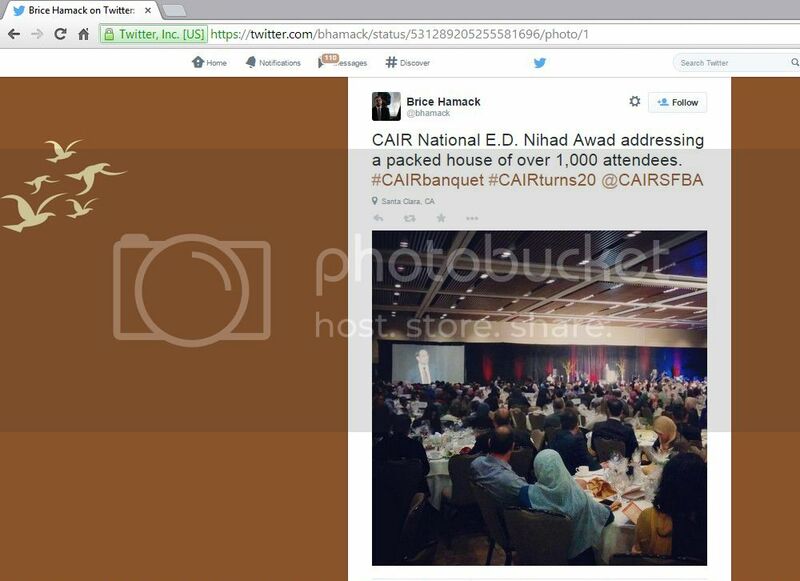 On her Twitter account, Billoo boasted that her CAIR event was sold out, and the pictures taken at it do show a full house. This is a frightening indication that many Muslims in America appear to support and approve of CAIR’s agenda. Certainly given the amount of information available about the speakers at the event, one would be hard pressed to believe that the attendees weren’t at least somewhat aware of CAIR’s terror-related background…. ….The change in the manner in which the government treated Islamism was profound. “Whereas the 9/11 Commission report, published under the presidency of George W. Bush in July 2004 as a bipartisan product, had used the word Islam 322 times, Muslim 145 times, jihad 126 times, and jihadist 32 times,” Gorka writes, “the National Intelligence Strategy of the United States, issued by the Obama administration in August 2009, used the term Islam 0 times, Muslim 0 times, jihad 0 times.” The omission is stunning. Some logic. Six years into the Obama presidency, not only has the vocabulary of jihad been removed from official rhetoric and counterterrorism policy, but troops have been removed from Iraq, troops are withdrawing from Afghanistan, the administration has condemned Israeli settlement activity while coddling Hamas’ backers in Ankara and Doha, “torture” has been banned, the White House intends to close Guantanamo unilaterally, Hosni Mubarak was abandoned in favor of the Muslim Brotherhood, and the president is desperate for a partnership with the Islamic theocracy of Iran. The result? The Islamic State rules Mosul, threatens Baghdad, and has conquered half of Syria as Bashar Assad gasses the other half. Libya has collapsed into tribal warfare. Egypt has gone from military dictatorship to Islamic authoritarianism and back again. An Islamic strongman rules Turkey, Hamas murders with impunity, Al Jazeera broadcasts anti-American and anti-Semitic propaganda around the world, and the Taliban are biding time in Afghanistan. Not only is al Qaeda not on the run, it governs more territory than at any point since 2001. It is once again the “strong horse,” attracting jihadists to its crusade who inevitably turn their attention to the West. “Without an ideological catalyst,” Gorka writes, “grievances remain merely grievances. They are dull and banal. They only transform into acts of transcendental violence when ignited by Sayyid Qutb or Osama bin Laden or Abu Bakr al Baghdadi. It is the narrative of Holy War that gives value to local grievances, not the other way around.” Before we can hope to “degrade and ultimately destroy” the Islamic State or the al Qaeda movement, we must recognize the poison tree of jihad for what it is. We must recognize the global and unitary nature of the threat. We must recognize that there is only one way to deal with a poison tree: You chop it down. HAMAS (an acronym for Harakat al-Muqawamat al-Islamiyya, which is Arabic for “Islamic Resistance Movement”) is an Islamic fundamentalist group founded on December 14, 1987 by Ahmed Yassin and Abdel Aziz Rantisi, members of the Muslim Brotherhood. Indeed, Hamas describes itself as “one of the wings of the Muslim Brother[hood].” As a single Arabic word rather than an acronym, “Hamas” means “zeal.” The organization’s avowed purpose is “liberating Palestine” from its Jewish “oppressors,” whose very presence in the Middle East Hamas considers an affront to Muslims’ rightful sovereignty over the region. Hamas is best known for using violent methods — including suicide bombings against Israeli military and civilian targets — as part of its long-term strategy to destroy Israel and replace it with an Islamic Palestinian state. The U.S. State Department, Canada, Japan, Israel, and the entire European Union have named Hamas as an Islamic terrorist organization. For additional significant excerpts from the Hamas Charter, click here. To view the Charter in its entirety, click here. The media, too, helped turn the plight of the expelled Hamas terrorists into the leadinghuman-rights issue of the day…. Hamas’ current worldwide leader is Khaled Mash’al, who first became a member of the Hamas Political Bureau in 1996.